City Mayors Urban Development Consultant Prakash M Apte, an Eisenhower Fellow, is a consultant on the staff of the World Bank. 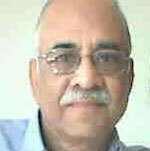 His major areas of focus are slum resettlement projects as well as urban development & city planning in India. He has headed national institutions in charge of housing & urban development and has worked at national & international level in the area of housing.